This Sharp End will appear in Alpinist 57—Spring 2017, available on newsstands in a few weeks. 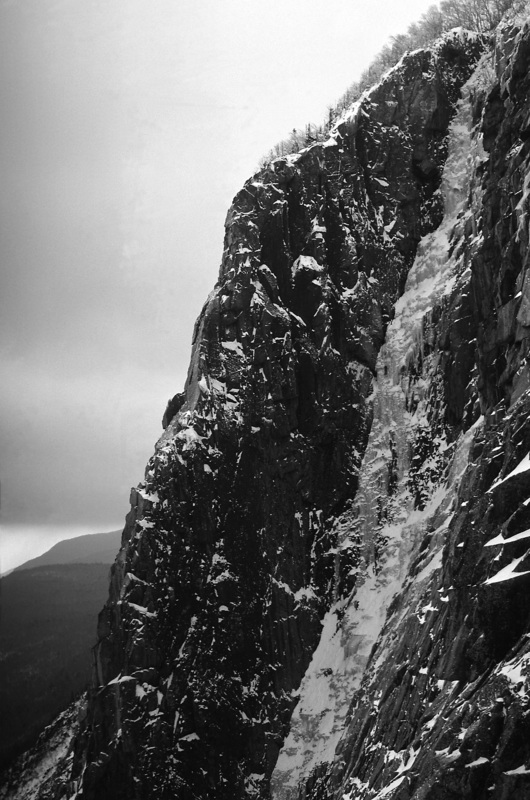 MARCH 1975, CANNON CLIFF, NEW HAMPSHIRE: For hours, Laura Waterman had stood in the dark winter shadows of the Black Dike, belaying her husband, Guy. The second pitch, that day, was a narrow labyrinth of fragile ice, a faint veneer of fractured lines that gleamed dull silver against the ashen rock. Guy reached a dead-end, backed down, and tried another path. Icicles shattered and crashed. Only four years before, John Bouchard had made the first ascent alone: he had untied from a stuck rope, broke an axe pick, dropped a mitten, and free soloed the last column through twilight and storm. Something of his fear seemed to permeate the chasm. Few had climbed the Dike since. Dusk was now approaching. Laura wiggled her fingers and toes against the cold. The void between the Dike and the rest of the cliff seemed to deepen, she recalls, growing ever more "unnerving." In silence, reflections of the sun passed over the opposing wall, flickered into gold and started to vanish. At last, the rope rose steadily again. They reached the top just before the failing of the light. The time spent in the heart of the wall lingered. "Oddly enough, I wasn't scared but in a state beyond fear," she told Thomas Jenkins, who quoted her words in Summit. "Our precarious situation was so patently obvious that I felt an immense calmness and clear-headedness that comes only when you know you are on the thin edge between living and dying. I believe one tries to recapture that clarity of mind when doing hard, even dangerous climbs." IT CAN BE DIFFICULT, afterward, to describe what it feels like to move along such edges: the way the world seems to break apart into luminous shards, each one a universe of its own; the way the boundaries of your self appear to merge with the landscape; the fleeting impression that everything broken and incomplete has been fused together, that you're part of something vaster, formed between earth and sky, cliff and air. I remember a few of these moments, unsought and yet embraced, not always in situations of serious risk, but often at uncertain thresholds, between the gloaming and the night, between the seen and the imagined. They remain in my mind as fragments without narratives, scatterings of images that seemed, briefly, to reflect all of existence: a fleck of green moss that hinted of life beneath the snow; a piece of hidden quartz that caught the tip of an axe. One early winter evening, an icefall began to crumble beneath my crampons. Translucent panes fell into the gathering shadows, blue into black. I shouldn't be here, I thought. It's too warm. Without protection, I had little choice except to continue this strange, upward dance between flakes of wet rock and soft ice, delicate edges that held my weight briefly before letting go. At last, from a safe anchor, I watched my partner follow a bend in the gully. The beam of my headlamp flashed off a tiny mineral beneath the surface like a star behind glass. And for an instant, the whole forest and the night was icelit, turned to crystal. MOUNTAINEERING LITERATURE is filled with stories of how a sense of precarious, heightened perception vanishes when climbers return to their homes—and of how the fading memory of it lures us back to the heights. Behind most of these tales lies the assumption, stated or unstated, of distinct boundaries between the unpredictability of the mountains and the expectations of life in the valleys. And yet the peaks remain connected to plains and waterways, brushed by currents of far-ranging winds, traveled by migrations of flocks and herds, filtering through human history, memory and dreams. And for many people, in their regular lives, uncertainty is an imposed condition, not a recreational choice. For more than a decade, the adjective precarious, so commonly used in climbing tales, has also proliferated across stories about the rest of existence. In 2013 and 2014 articles for The American Anthropologist, Andrea Muehlebach and Sarah Ives have noted how the word is now associated with a wide range of modern uncertainties. Precarious is often used to evoke the way that contract work, globalization, automation and technological innovations break down steadier patterns of employment that millions have relied on. It appears in descriptions of the impacts of global warming, as rising sea levels and glacier outburst floods threaten coastland and mountain communities alike. And since the November elections, like many Americans, I've felt acutely aware, as well, of the sense of precariousness our country faces—amid the growth of hate crimes and public expressions of xenophobia, the fears of a dismantling of environmental and health protections, the potential vulnerability of our democracy. Dominant forms of adventure media do little to prepare us to confront these bleaker, larger forms of risk and change. Faced with the possibility of widespread ecological disaster, the classic heroic narrative of individual achievement seems more and more solipsistic. Nonetheless, outdated, violent metaphors of the conquest and possession of nature persist in tales of crushing the rock and bagging the peak. Trip reports rely on strings of generic words—obvious corner, untapped potential, mixed terrain, unlimited possibilities—turning crags and peaks into strangely abstract, placeless backdrops, as if their only function is to provide seemingly endless opportunities of self-expression and promotion, resources for climbers to extract. Feverish accounts of the developments of crags reflect images of Manifest Destiny and urban sprawl—the same kinds of ideas that helped push our civilization to its current edge. Exhortations of believing in yourself and following your dreams fail to take into account the realities of hidden costs and uneven opportunities. Notions of blanks on the map frequently ignore the prior presence and knowledge of the original inhabitants of a land. The archetypical, oft-repeated story of protagonists leaving behind the security of modern life for the uncertainty of the mountains conceals both unacknowledged privileges and delusions. Adina Scott, part of an African American mountaineering team, Expedition Denali, points out that for many members of marginalized groups daily existence can present hazards and challenges that are incomparable with—and much greater than—those in the heights. If mountain literature is to remain relevant in the future, it will need to reflect immense, ongoing transformations in both the cultural and physical landscapes of ascents. Already, we can no longer follow the old maps and topos for some of the most legendary routes. With the thawing of ice couloirs and snowfields, entire histories vanish. Forests climb ever higher up valleys, while glaciers recede. The fantasy of the mountains as a pristine, sealed-off realm shatters and thaws. The really intensely clear moments aren't everyday occurrences. But we can use what we've learned from these moments.... I think now, especially with climate change, we are without a doubt living in a precarious world. We have to learn to live with that. We have to make the right decisions, ethically, as best we can. Our existence and our world is at stake.... But the more we can experience the joy of being in the world, in nature...well, then we'll start feeling love for where we are, where we live on the earth, and then perhaps we'll wake up and start taking care of our home.... We take care, in the stewardship sense, of what we love. But first we have to learn to love it. To do so, truly and deeply, we may need to look beyond the edges of our genre to literature that encompasses more of humanity and more of the earth. For two years on his CaringBridge site, mountaineering author David Roberts has chronicled his experiences of facing cancer. At one point, he opens Elisabeth Tova Bailey's memoir, The Sound of a Wild Snail Eating, in which a chronically ill author finds solace for "chance, uncertainty, loss and the sharp edge of mortality" in a tiny snail kept in a terrarium by her bed. "Watching another creature go about its life…somehow gave me, the watcher, purpose too," Bailey wrote. "If life mattered to the snail and the snail mattered to me, it meant something in my life mattered." Upon finishing the book, David recounts, "I keep thinking, Where is my snail?" Perhaps, it is not transcendence, but immanence that we need to seek—a recollection of all that infinitude of being, worth and wonder that exists, not only in the grand, the alpine and the monumental, but also within the singular, the seemingly ordinary and the small. IN THE 2015 JOURNAL OF PERSONALITY AND SOCIAL PSYCHOLOGY, a group of psychologists published a study of awe, searching for ways that "fleeting" visions of the sublime could help people identify with something vaster than themselves and learn to become more focused on the well-being of others. To me, Lauret Savoy's recent book, Trace: Memory, History, Race, and the American Landscape, offers one map for mountain stories that could be more conducive to empathy and engagement in a world at risk. As she travels across ranges and deserts in search of half-vanished geographies of dispossessed African American and Indigenous people, she encounters a land marked by dystopian fragmentation, silenced histories, ecological damage and climate change. There, she finds a lingering hope in an act she calls re-membering, a word resonant not only with the idea of recollection, but also of piecing together what has been broken, of re-creating a single body, a sense of place that includes all dwellers in this country. "Re-membering is an alternative to extinction," she writes. "Home indeed lies among the ruins and shards that surround us all." What new visions and calls to action we might thus discover in the very brokenness of the earth, in the silences, the fragments and the absences; in the idea that stewardship and love, put to practice, are more transformative than the surpassing of any mountain fears, more illuminating than any sudden clarity along fragile cliff edges—and more revolutionary than any alpine ascent. Amid the darkness that now drifts across the valleys and the heights, we might remember: it is the precarious situation of living on this earth that binds us all.